If you are sick of hearing and reading about the wrongs and rights of activists kneeling during the National Anthem, keep reading. If you are undecided or firmly rooted in your ideas about our First Amendment rights and how they are expressed before, during, or after the playing of a song that represents our country, I beg you to stick with me. If you think there are too many voices screaming too many messages without a sympathetic ear listening to their left- or right-wing counterparts, then you are in the right place, because while I certainly have an opinion on the political climate in our country, I'm not about to share it. I'm not afraid to express my opinion, but I made my stand when I went to the polls last November, and until the next election, I'll be kneeling, in my home and in my church, and anywhere where God's grace is needed. Aside, from First Amendment Rights, we also all have an opportunity to express our opinion on the second Tuesday, after the first Monday of November, every four years. In between those years, it's up to each individual to advocate for their side in whatever manner they deem appropriate to win the wavering hearts of onlookers or sway their adversaries. I'm taking an active stance, I have a lot to say, and I'm doing it through action rather than expressing my opinions. 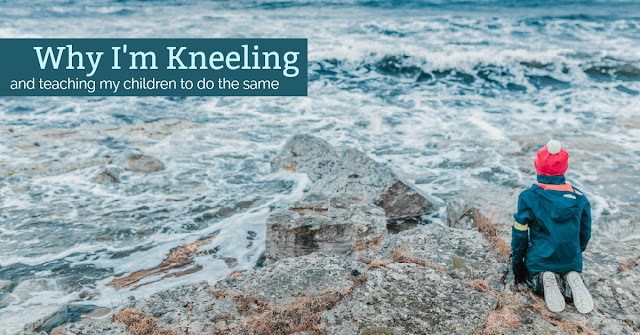 I'm doing it by teaching my children to kneel before their Heavenly Father and pray. I'm teaching these little minds and tiny hearts how to love their neighbors, how to care for the disenfranchised and poor, how to comfort those who need comforting, and remember the forgotten. Most of all I'm trying to teach them that the most important thing you can kneel in front of is the Cross. My action and commitment to my cause starts within my home, with children. I am growing where I'm planted, and right now I'm called to be a guiding light for two inquisitive minds with whom I share a roof. God has entrusted me to teach them the virtues of love, hope, faith, prudence, temperance, courage, justice, charity, and fortitude. I'm not a perfect mom, and I'm not teaching my children perfectly; I'm doing the best I can with the time and resources available to me. I am not bothered by men and women sitting, kneeling or standing. Peaceful protests are an incredible privilege to us as American citizens. I don't feel the need to fill your Facebook wall or your Twitter feed with posts and think they will change your mind. You're smarter than that and far too educated to be swayed by 140 characters. Plus, I'm too busy trying to change the hearts and minds of my tiny prayer warriors. The greatest gift I can give this world is two faithful, honest, pragmatic, and educated children with their own opinions and the ingenuity to make their voices matter. Children who know Their Father has abundantly blessed them with the right to stand for those who cannot stand for themselves and kneel for their Savior and any cause they believe worthy of their prayers. Thank you for this! I was nervous to read this - but, I loved how you pulled this in to Catholic motherhood. I recently told my husband I am too busy trying to teach my children to be good people and do good things than engage in the “take a knee” debate. This reminded me of that - my primary mission in life is to be a stellar wife, and ensure I equip my children with the values that will allow them to be able to take a stand for those in society who need that advocacy. To equip them with the values to embrace all people - regardless of gender, race, ability, or creed. Beautiful handling of what can be a difficult, sticky topic these days!